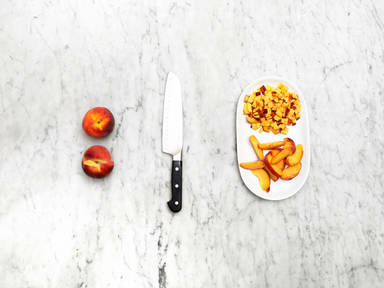 If your peaches are ripe, use a knife and halve the peach along its core. Turn the two halves against each other. Quarter, then cut into wedges or any other desired shape. If the peach is still very firm, slice around the core. Dice, if desired. Enjoy pure, for desserts, or as a fruity companion for pulled pork or any other kind of meat.